Used Book Sales at Locust Grove support all of our programs, from preservation to education. In twelve years of book sales, we’ve raised more than $300,000 – all through donated books! What to donate: We take books in all categories in good used condition, hardbacks and paperbacks. Reasonable wear and tear on books is fine, but please, no badly damaged or mildewed books. We don’t take textbooks, magazines, or encyclopedias. We do take CDs, DVDs, and audiobooks. 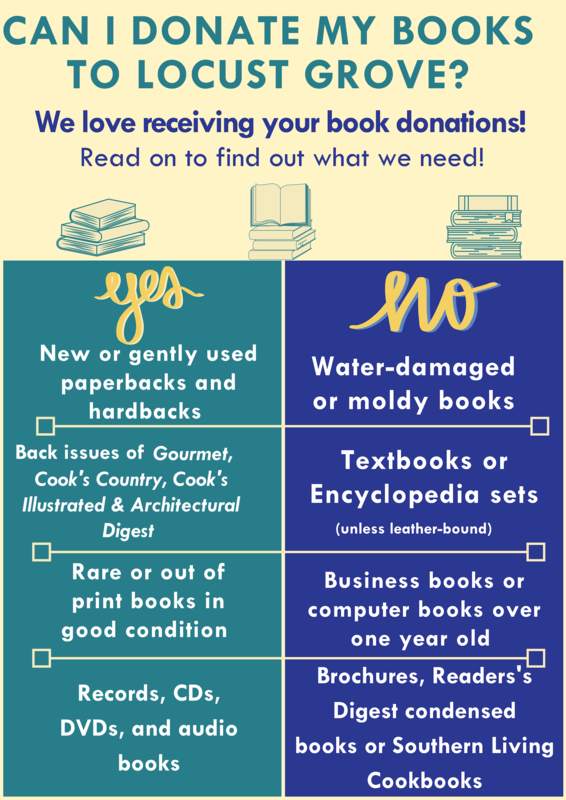 How to donate: bring your books in boxes or bags to Locust Grove during our open hours. We’ll gladly take them and give you a donation receipt. If you cannot bring them we will try to pick them up from you, so call us at 897-9845, but pickup will depend on the availability of our people and on your location, so please be aware that we might not be able to get to you right away. Schedule of sales: The big used book sales, with all prices and all categories, are in early March and late August. Smaller sales of individually priced antiquarian, collectibles, and high-quality used books are scheduled with our Antiques Markets on the last weekend in June and the last weekend in September. A sale of gift-quality books is part of our holiday program on the first weekend in December. Watch our webpage for details, and sign up for our email list. Members’ Preview: Members of the Friends of Locust Grove get access to the two big used book sales on the Thursday evening before the public opening. Membership also brings invitations to non-book events at Locust Grove, and discounts on some programs. Join here. Staff & Volunteers: The sales are coordinated by Charles Bartman and Harvey Venier, with the assistance of a corps of volunteers who sort, set up, and sell the books at the sales. If you are interested in volunteering to assist, email us for details. Sponsors: Our sale sponsors donate to help cover the costs of running the sales, so that all of the profit goes directly to the programs of Locust Grove. We are grateful for their support. 2019 sponsors include: Bonnie and Charles Bartman; Jennifer McCormick; Irene Rawlings; John Stites; Jeannie & John Vezeau; and Richard Young. Thanks!